Gamers are happy to pay for DLC, online passes, and microtransactions, says BioWare. If you played Mass Effect 3, you've probably noticed that the game has more DLC than you can shake an Omni-Tool at. Between multiplayer expansions, ending patches, online passes, and item packs, you could end up spending a lot of money on top of the initial $60 investment to see the end of modern gaming's most celebrated sci-fi trilogy. While some of the DLC is free, and the rest maxes out at about $10 a pop, BioWare has been raking in money hand-over-three-fingered-fist with these downloadable extras. While giving a presentation at GDC Europe, Fernando Melo, director of BioWare's online development, laid out the company's business plan. "Fans do want more content," said Melo. "From the moment the game launches ... So it needs to be there when it's ready." Mass Effect 3 fans will remember From Ashes, the day one DLC pack that added an extra squadmate who could add quite a lot of backstory and combat advantages from a relatively early point in the plot. Even if fans do not want to dish out an additional 1/6 of the game's cost as soon as they get home from the store, Melo argued that there's no rush. "They choose when to pick it up, day one or later." In addition to touting the virtues of an Online Pass - a one-time content access code that made up 11% of Mass Effect 2's DLC revenue - Melo believed that microtransactions are the best way to ensure a constant revenue stream from a game that has already been released. "If you have five DLC packs at $10 each, you can only ever earn a total of $50," Melo explained. 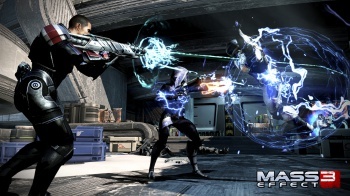 Mass Effect 3, however, offers cheap, randomized multiplayer item packs, which are also purchasable with in-game funds. Offering real-money transactions for convenience or in-game money for time and patience offers the best of both worlds, according to Melo. "Gamers are actually happier, as they are able to spend money when they want." For those who might scoff at Mass Effect 3's DLC and microtransactions, Melo did offer one interesting point: These sales subsidized the game's plentiful free multiplayer DLC, ensuring that players get a steady stream of varied content, and that developers get to stay on the Mass Effect 3 team. Whether or not gamers are really "happier" with this business strategy is hard to say, but at the very least, they're not too upset to open their wallets for it.